Fill the fields below with your information and we will contact you to address your needs. While general electricians can do most jobs sometimes you just want specialists. Here at fuseboard.ie we fit new MCB (Miniature Circuit Breaker) fuse boards. They’re different to the older models in that when the current becomes too high the MCB simply switches instead of blowing a fuse. This means it’s much easier to flick the switch back on (when the fault is dealt with) instead of having to replace the fuse every time something goes awry. The MCBs are also safer as they’re more accurately able to judge the amp size before flicking, whereas fuses can sometimes handle more current than they’re supposed to. Our fuse boards are also fitted with RCD (residual current devices). These are safer because they will shut down entire sections of the electricity in your sockets if they sense an imbalance in the current — from power-hungry devices such as storage heaters. They’re an extra check that rarely flips, but are designed to keep you as safe as possible. 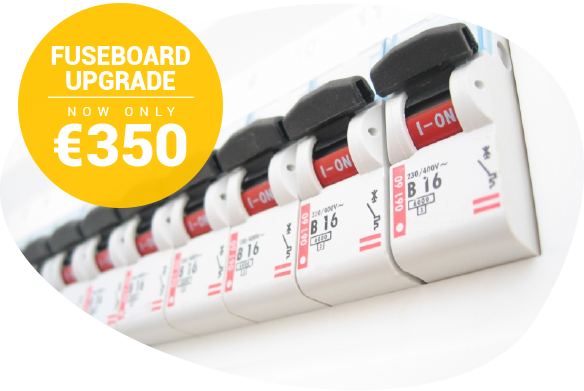 Our Fuse Boards are much safer and far less hassle than the older boards still in thousands of Irish homes. We also provide storage heater installation and repairs, over at storageheater.ie. We have everything you need to fit a storage heating unit. Storage heating units are a cost-effective way of heating your home. Storageheater.ie electricians have years’ experience in fitting and repairing storage heating units, so check out storageheater.ie for a wide range of storage units, perfect for any budget. Some appliances in your home need an RCBO. It’s essentially a special breaker for high powered electricity or external wiring. For example one needs an RCBO if they have an electric shower because the energy used to heat the water so quickly is very high and needs extra protection to ensure safety. Other uses for an RCBO is if you wire something like an external shed. The reason for this is the RCBO can shut off power to just the one thing that’s connected to it without affecting the rest of your home. It’s necessary for a shower, but people often like using them for things like there shed so that if it loses power it won’t affect your entire home. Every RCBO you use is a small surcharge on top of the fuse board installation cost, so please beware of this. If you’re moving into a new home as a tenant or a homeowner beware that some insurance companies won’t insure for fire or electrical faults without the new fuse board and the ESB won’t recognise maintenance work on the homes without newer models. Some older fuse boards don’t even incorporate an earth rod which makes them far more dangerous as there’s nowhere for excess electricity to go which can be important when occupants have reduced mobility or are accident prone; such as the elderly or children. Fuseboard.ie can solve all these problems by installing an earth rod (if necessary) and fitting a far safer fuse board that helps your safety, your insurance and causes less hassle. Getting a new fuse board is really a no-brainer. Fuseboard.ie main task is Fitting new fuse boards to make Irish homes safer. Older boards often have trouble detecting problems with electric showers or immersions that can shut off the power to your entire house or even cause a fire if left ignored for too long. Fuse boards can feature multiple RCBOs, so if an electric shower blows an RCBO will prevent it shutting off the rest of your home. Similarly if you electrify some external appliance it will stop that cutting off the rest of your home if weather knocks the power out. If you own a home without an earth wire we can install one for you. These are vital for electrical safety as without them any overload of power will result in power outages, shocks or fires. With earth wires overloading electricity travels straight into the ground. Our brand new fuse boards are the gold standard in the electrical industry worldwide. They are what the ESB recommends, what Insurance Companies want to see, and are perfect if you’re a landlord renting out your home and need to qualify some safety concerns. If you’re happy with the quality workmanship of the electricians here at fuseboard.ie, we offer the same quality work through our partner company repairmyhome.ie. Over at repair my home we offer full scale building operations where we can construct your dream house extension. We have built new houses and large extensions you see on the corner houses of estates that you see every so often. You can check out our project gallery over at repairmyhome.ie. Use the contact form to the left to send us a message. Alternatively, you can reach us through the contact details listed below. Copyright 2019 Fuseboard Ireland. All rights reserved.